The campsite is OPEN ALL THE YEAR ROUND. It is beautifully situated just 3 km from the town centre and very close to Storsjöbadet, adventure swimming with indoor and outdoor pools. Exercise and ski tracks on the doorstep. Minigolf etc. We have cottages of different sizes, rooms, large pitches with electricity and private water and drainage; all the pitches with electricity have cable TV. ÖSTERSUND is located in a fascinating natural area, with water, forests and meadows. Only an hour away are Årefjällen at Åre, Sweden's largest Alpine skiing resort. There is plenty to do in this area both in summer and winter: clean air and magnificent scenery, skiing, fishing, sightseeing, boat trips, swimming, walking etc. Sights include "Jamtli Historieland", Sweden's first combined indoor and outdoor museum, Frösö Zoo, Frösö church, Sommarhagen etc. Östersund also offers plenty of entertainment, as well as sport and recreation, including two golf courses - Östersund Frösö and Storsjöbygden. 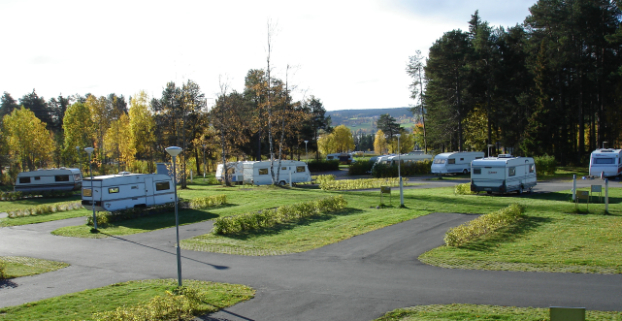 If you stay at Östersunds Stugby & Camping you have easy access to everything that Östersund and the surrounding area have to offer.